Cottage 1 offers a large, three bedroom, two-floor living space with family/dining areas combined, a fully equipped kitchen and a first floor bathroom outfitted with a stand-up shower. Upstairs offers three bedrooms (1st bedroom: double bed, 2nd bedroom: 2 double beds and 3rd bedroom 1 double bed and 2 twin beds. There is also a queen sleeper sofa in the living room). There is a $25 pet fee per stay charge for 1 dog and $50 for 2+ dogs per stay due at time of check in. We do require that pets left unattended in our pet friendly cottages be crated while you’re away. Book a Reservation for Cottage One HERE. Book a Reservation for Cottage Two HERE. Cottage 3 offers a relaxing, two-bedroom, one floor living space with family/dining areas combined, fully equipped kitchen and a bathroom outfitted with a stand-up shower. The 1st bedroom has two twin beds, the 2nd bedroom has two twin beds and there is a day bed in the family area that can be used for overnight sleeping. The heat source in this cabin is a thermostatically controlled, visual blue flame propane heater. 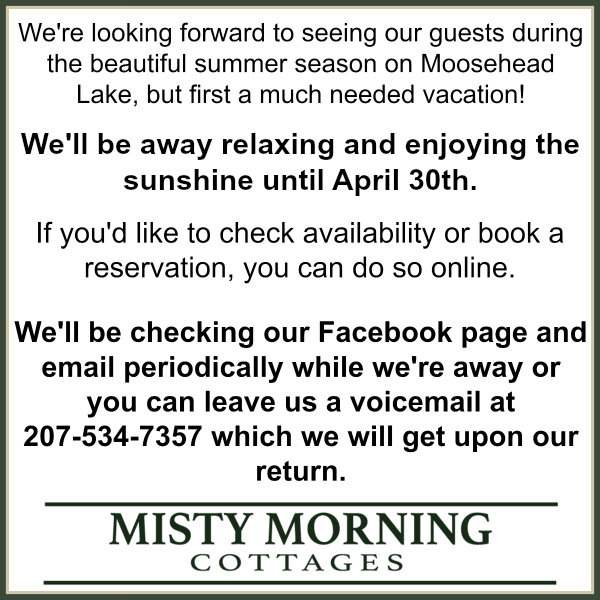 Book a Reservation for Cottage Three HERE. This quaint two-bedroom living space offers a combined family/dining area, a fully equipped kitchen and a bathroom outfitted with a stand-up shower. In this one-level cottage, the 1st bedroom has a double bed and the 2nd bedroom has two twin beds. Our heat source is a thermostatically controlled pellet stove with a propane monitor heater backup. Only Cottages 1-3 are pet friendly. If you reserve a pet free cottage and arrive with a pet we reserve the right to refuse your stay and your deposit is not refundable. Book a Reservation for Cottage Four HERE. Cottage 5 offers a serene, two-bedroom, two-floor living space with a combined family/dining area, a fully equipped kitchen and a bathroom outfitted with a stand-up shower, in the downstairs bedroom there is a double bed and in the living area there is a sleeper sofa available. Upstairs, the spacious loft area acts as a 2nd bedroom and has two twin beds and one double bed. Our heat source is a thermostatically controlled propane monitor heater. Book a Reservation for Cottage Five HERE. Cottage six offers a cozy and comfortable, studio-style living space. Everything you need is at your fingertips. This area is outfitted with a double bed, a fully equipped kitchenette and a private bathroom with a stand-up shower. Our heat source is a thermostatically controlled propane monitor heater. Book a Reservation for Cottage Six HERE.